America first? The way things are going . . .women and children first. 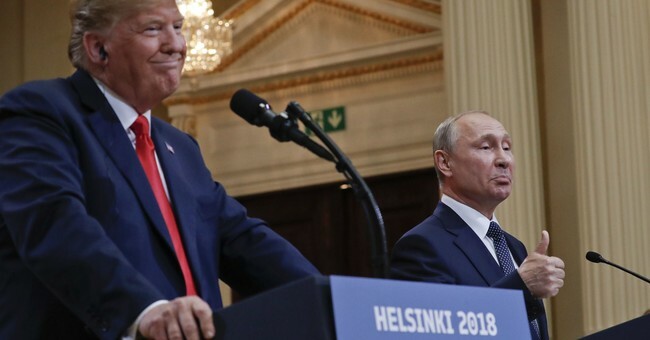 As was widely reported, and harakirid-to, Mr. Trump, in his Helsinki news conference with Russian President Vladimir Putin, said that he “would be surprised” if it had been the Russian government that hacked the Democratic National Committee. That contradicts, of course, the pronouncements from America’s 347 different intelligence agencies that the Russians did it. After reaping yet another media whirlwind, Trump made a rare admission of error, explaining that he had meant to say “wouldn’t” — that is, he would notbe surprised if Russia hadhacked the DNC. One wonders: Who hasn’t hacked the DNC? But really, is the biggest story here Russian meddling in our election process? With guns and bombs, Russia has meddled in eastern Ukraine, Syria and don’t forget Georgia (not the one next to Alabama . . . though Trump has offered). That’s a much meaner meddling. And it is not as if the good ol’ USA doesn’t intervene every bit as much (or more) in the internal political affairs of other countries and their elections. Moreover, we likewise intervene militarily to topple foreign governments at will . . . when our political machinations proveunpersuasive. Perhaps we can tap our vast reserves of hypocrisy to even out some of these trade deficits. The actual crisis? Our political impotence: the federal government is completely out of our control. Though it will shock those suffering from Trump Derangement Syndrome to acknowledge bedrock reality, this is nothing new. Or unique to the Trump Era. The previous president, the much media-beloved Barack Obama, kept a secret kill list on his desk. Without any legal process, he could and did order the murder of many, including American citizens, who were not charged nor convicted of any crime. He also engaged this nation in the military overthrow of another nation, Libya, without any congressional authorization and without even following the minimum legal requirements of the exceedingly weak War Powers Act. Not to mention his oft-repeated lie about the most important “achievement” of his administration:No, you couldn’t keep your doctor. President George W. Bush had José Padilla arrested as an “enemy combatant” and held without charge for three and a half years in clear violation of the basic rights of an American citizen under the Constitution. W’s Justice Department also justified the use of torture. As we pass the popcorn, we might reflect, also, that trouble with words is not limited to the current administration. One might think that presidents would be especially adept, rhetorically — like using words in a sentence and everything, man — but our Leaders of the Free World have had some problems with Words. And who can forget when the two Bush presidents were sued by the English language for mental anguish? The failings of past presidents does not excuse President Trump’s, of course. Yet, it does suggest the abuse of power and persuasion is sadly not unique to Trump. And it is not even a federal issue. Illinois has reserved prison space for its governors, Massachusetts recently indicted three consecutive House speakers on corruption charges while the great state of New York sent its last House Speaker and Senate President to jail. This may seem like a small thing in comparison, but living near the nation’s imperial capital has allowed me to follow the trials and tribulations of the Prince George’s County (Maryland) Public Schools. First, the schools set records in upping their previously dismal graduation rates, resulting in bonuses for teachers and administrators, and praise for CEO Kevin Maxwell. Then it was discovered that the jump in graduation rates came about only from fraudulent reporting. That controversy, and others, led Maxwell to resign his position . . . and then receive a severance package of nearly $800,000 to vamoose. This same phenomenon plays out all the time and all across the nation. Failure rewarded. The system rigged, gamed, ripped-off. No one held accountable. Could it be that nearly everyone in government — from your kid’s school to city hall to the state capitol to Washington — is on the take? We are even told to worry that the leader of the Free World might be doing the bidding of a foreign power, authoritarian Russia. Rather than focus on personalities and ramp up on partisanship, two foci that played no small part in adulterating our representation and liquidating the accountability of government, America should return to fundamentals. Citizens must have more choices, including greater recourse through recall, referendums and initiatives. We also need term limits so that individuals cannot capture a powerful position to tilt society to their benefit . . . and that of their cronies. Representatives must be close enough to actually be “one of us.” That means congressional districts much smaller than today’s, which average over 725,000 people. And most of all, we must take action where we can: close to home. For now, forget Washington — “the swamp remains,” and remains undrained, for a reason. The problem is not new, and not one man. Nor will the solution be.